Station & Carriage: The English Pouter is unmatched in the pigeon world for it's upright station. When posing, an excellent speciman will stand so upright that its eyes will almost line up over the balls of the feet. A well trained show bird will consistantly be strutting and showing off with its globe well flated. When the bird walks and struts it should not waddle, but should carry itself elegantly and proudly with strong high stepping legs with the feet going forward and not sideways. The analogy most often made in describing the perfect manner of walking is to compare it to a prancing horse and is exactly how the bird should appear. Globe & Neck: A pouter without a globe is not a pouter. The standard calls for a long neck and a corresponding well inflated proportionally large round globe that is sharply sprung from the waist. Proportion is the key to suitable globe development. A bird with an excessively large globe will often over blow and rear back. Another deviation is the sausage shaped globe. Some fanciers erroneously believe that a sausage shaped globe is caused by too long a neck, however the truth be known, this problem is caused by a lack of elasticity in the neck tissue. The importance of a round globe is not only for the front part of the bird but must include the back of the neck or back globe as it is called. A well developed back globe is essential in giving the entire globe a very rounded appearance. Body: An ideal body for an English is best describe as slim, trim, and sleek. The waist or keel should appear long, narrow and V-shaped with a well defined keel. The waist should appear to be almost one third of the bird's length. In order to maintain the illusion of slimness, it is of the utmost importance that the globe appear to spring from a slight indentation at teh top of the keel. A narrow girth, or small body circumference is also absolutely necessary in conveying slimness. The wings play an important part in accenting the narrow body and long waist. The wings should appear narrow and carried high and tight against the body. The tops of the wing butts should be narrow, flat and hidden by the bottom sides of the globe. The wings should rest on the tail and ideally should touch and not cross. the back should have a small hollow at the shoulders. The back should fall off in a straight plane directly to the end of the tail. The ideal tail is short enough to clear the ground when the bird is either performing or posing. The tail should appear as narrow as a feather's width. There are two very serious faults to contend with in the tail. The first is the split tail or tendency to show a break in the tail when it is fanned or just held naturally. A split tailed bird usually doesn't have an oil gland. The second serious tail fault is the wry tail that veers to one side when the bird is standing, walking or performing. I do want to mention that some judges have the ridiculous practice of checking for wry tail by holding the bird in their hand and shaking it downwards. If a bird doesn't show any wrying of its tail when it is standing, walking or performing then there is no need to pursue the matter any further. Both the wry and split tail are genetically transmittable faults and unless the bird is vastly superior in all of its other characteristics or unless better breeding stock isn't available I would not advise using a bird with either of these tail problems. Legs & Feet: Legs are a very important feature. They should be as long as possible with special emphasis placed on extra length from the foot to the knee or hock. The legs should smoothly clad with feathers giving them a stocking appearence and the feet and toes should be covered with enough feather to give the impression of the bird wearing slippers. The two leg feathering faults are rough or heavily feathered legs and spare or sparsely feathered legs. Years ago special classes were provided for rough limbed birds. Today a rough limbed bird is not considered a show bird. The legs should appear fairly straight with a slight angle at the knees to him from appearing stilted. If the leg has too much angle the bird will appear to sit back on its haunches. This fault has been referred as to being "down in limbs" or "over angulation" of the limbs. This fault and stilting are serious ones. When viewing the legs from the side angle a continuous smooth flowing line or sweep should be formed from the birds keel over the top of the thighs. When the thighs are excessively curved they break this sweeping line and are said to hinge. While it is highly desirable to have the thighs blend in smoothly in a continuous line from the waist, it is not always possible. Some judges and fanciers are overly critical of birds showing slight musculature of the thighs. The point is that while we obviously don't want to breed the same kind of thighs that a French Pouter has, there should be a happy medium between the natural musculature of the thigh and the perfect sweep that the standard calls for. We certainly wouldn't want to sacrifice strength of legs for a perfectly straight-lined sweep. The standard calls for the legs to be well set back on the waist. Here too there can be a detrimental deviation when the legs are set too far back. In this case the front part of the body is carried at a 60 or 70 degree angle while the rest of the body appears to boat or follow the horizontal plane. the ideal upright station should never be sacrificed; it is one of the hallmarks of the breed. When viewing the legs from the front, they should appear close together to the knees and then spread gently outwards. The feet too should appear to point outwards. One of the most serious problems that occurs from breeding very closely set legs is straddling. This also occurs when the legs appear to come out of one socket which they shouldn't. Contrary to a popular myth, an excellent English should not waddle as it walks. When a bird straddles the legs are thrown out sideways in an ungainly fashion. The best way to avoid having any problem with straddlers is to mate a tight or close legged bird with one showing a slight gap between the legs. 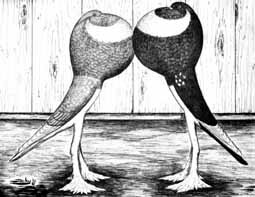 Assurely, continuous and constant mating when both birds are very tight-legged will yield a greater average share of straddlers. A straddler actually isn't worth breeding from unless one has no other stock. An equally serious fault is the bird that has cow hocks. When a bird is cow-hocked the legs appear as an X. They are open at the top, touch at teh knees and open again. A cow-hocked bird is a cull. (Get rid of it) Very little has been written about the toes except in the reference to toes that are bent under which is considered a serious fault. A super show bird will not stand flat footed but will stand on it's toes with the back ones carried slightly off the ground. Size: The ideal English Pouter should stand 16 inches tall. Some English exceed this height but most birds are closer to 15 inches in height. Common sense dictates that the fancier is the controlling factor for the size of his birds. Selective breeding that adheres to the standard's guidelines can be the only sure way to achieve any success. I feel that the best way to describe markings is to refer the reader to the standards, however I do want to draw attention to a few areas of the markings. When the crescent runs up to the eyes or surrounds them one often encounters bull or cracked eyes. The eyes are so colored because of the white pigment of the feathering. It is difficult to breed the perfect rose marking on the wing butts. It is better to have a limited number of white feathers on the shoulders or none than to have an excess which causes the fault "bishop wings" (excessive white feathering on the wing butts that go to the edge of them.) Birds with large "bishop wings" tend to produce more of the same. The last point dealing with markings is the white tail for reds, yellows, mealies and creams. 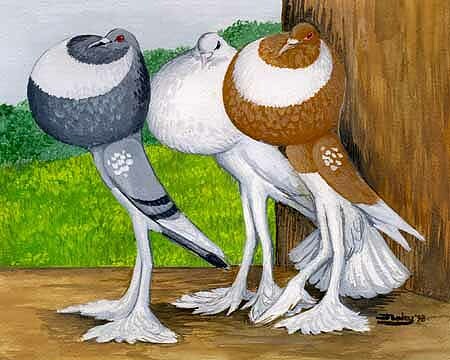 It is impossible to breed pure white tail on an ash red pigeon. (All pied marked Pouters are ash red). While a near white tail can be bred, the norm is for the ashy color to be seen on the feather shafts. I feel that it is a crime that some judges who don't know anything about color genetics heavily penalize an ash red or it's dilute because it doesn't have a pure white tail. Color: The standard colors are Blue, Black, Red, Yellow, Blue Check, Black Check, Silver, and Dun. Pied and Whites. Please take note that Mealy and Cream colors are now well accepted as standard colors here in the USA and also in Canada. Brown Spread and Khaki are also growing in popularity in this hemisphere, not only amoung English breeders but other pouter varieties as well. Wry Tail Tail carried to one side. Split Tail Tail feathers so inserted as to divide the tail and show a distinct break or V-shaped parting in the tail when bird is standing or in motion. Straddling Legs which, due to weakness, lack of control or deformity prevent the bird from standing or walking properly. Legs are set that they spread excessively at knees or slips sideways when bird walks or stands. This will prevent it from standing at its full height, and from having proper action when in motion. Ricket Knees Legs which are set wide apart at the knees and then spread out at the feet, giving an appearance when viewed from front or back, making bird look knock-kneed. Club Foot Deformed foot or two or more toes on each foot bent back under. English Pouter standard colors of Blue, Yellow and White in this picture. The standard colors are Blue, Black, Red, Yellow, Blue Check, Black Check, Silver, and Dun. Pied and Whites. Please take note that Mealy and Cream colors are now well accepted as standard colors here in the USA and also in Canada. Brown Spread and Khaki are also growing in popularity in this hemisphere, not only amoung English breeders but other pouter varieties as well. Notice the stance of these birds. If you have any questions about the English Pouter - Please drop us an email. We'll be happy to help you to learn more about these delightful birds.